mathematically showing that there had to be a GREAT MUSICIAN designing and playing the chords of these heavenly bodies. Red Light Shift ). And furthermore Earth is destined to be where the Lord of the Universe places His Eternal Universal Headquarters called New Jerusalem. its specific vibrational reading and musical note. (SEE Graph). And now we can see if the Moon and the Earth are in tune and harmonic together. days and calendar in accordance to its phases. 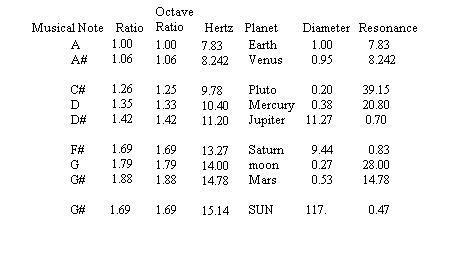 lowered or heightened octave of each planets R.F. put in the 3rd column. alignment. (SEE Alignment). For again, the Lord uses these heavenly bodies for signs, just as the three wise men mentioned in the Gospels, knew. 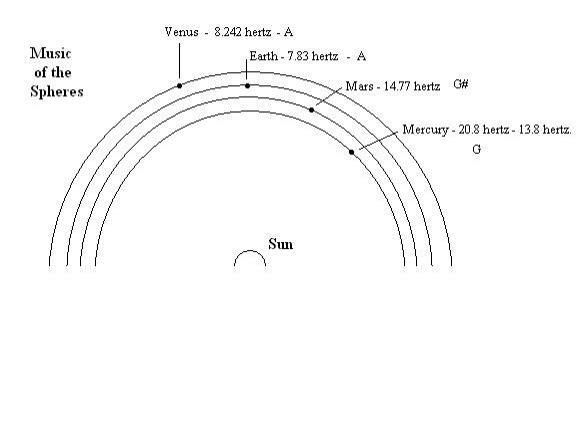 If we place the planets with their notes as a diagram with the Sun as the center of the Solar System it looks like this. And furthermore, it is said that F sharp is the note reached inside the Lords Great Pyramid at Giza. (F # Key to Kings Chamber). you might concentrate on is understanding that YES, there is an exact correlation between the planets and our moon with the Earth and its musical. So like the ancients, we can literally hear the Music of the Spheres if we are in tune with its Creator .. and His name is Jesus.